We are all painfully aware that there are limits to what our brains can do, cognitive limits. We can only handle a tense emotional situation for just so long before cognitive overload sets in and we freak out. We can only hold a limited number of bits in our heads at the same time due to limits on working memory capacity, the temporary storage system that allows us to pay attention to and manipulate information. Surprisingly, the limit is only 7±2 items at once. To get beyond that, we group items into chunks then manipulate the chunks, a kind of cognitive compression strategy that reminds me of Steve Jobs’ famous observation “creativity is just connecting things”. Interestingly, chunking is also a storage and retrieval strategy for long term memory. What happens if we take the notion of cognitive limits to the social realm? Robin Dunbar (University College, London) did just that and his studies led him to assert that there is a limit to the number of people with whom you can maintain stable social relationships; relationships in which you know who each person is and how each relates to every other person. He asserts that this is a direct function of cortical processing capacity, which in his view is a function of neocortical volume. That is a far reaching concept and the neurobiology is vague, but if true it impacts a lot of things from social evolution, to corporate structure, the impact of the internet and even how we view higher brain functions. Dunbar proposed the Social Brain Hypothesis which contends that primates have large brains because they live in complex societies; the larger the social group, the bigger the brain. Accordingly, from the size of the brain, the frontal lobe in particular, one might be able to predict the optimal social group size for that animal. In a meta analysis, he related primate brain size to the average size of the social group each species lives in. His estimate of brain size emphasized the neocortex and he judged the size of the social group based on the number of animals that practice social grooming together. The study looked at 38 different primate groups and he found a strong and remarkably linear correlation between brain size and social group size. Dunbar had data on humans as well and it occurred to him to ask what the optimal human social group would be based on the data from nonhuman primates. He fit a linear regression to the group/neocortex ratio for non-human primates and extrapolated it to the size of the human neocortex. Judging from the size of an average human brain, the number of people one would have in her/his social group is predicted to be one hundred and fifty. This is Dunbar’s number, ~150 (95% confidence interval; 100 to 230). Anything beyond that, he suggests, is too complicated to handle at optimal processing levels. Support for Donbar’s number comes from unlikely places. The average group size among modern hunter-gatherer societies is 148.4 individuals. Company size in professional armies is close to 150 from the Roman Empire and sixteenth-century Spain to the twentieth-century Soviet Union. Then there is the interesting story of GORE-TEX, the company that makes rain gear and such. Bill Gore, the guy who founded the company, was quite successful and he opened up a large factory that also continued to grow. Then one day he walked into his factory and realized he simply didn’t know who everybody was. He wondered whether as the company grew, people would start to become less likely to work hard and help each other out. He observed that after putting about 150 people in the same building, things at GORE-TEX just didn’t run as smoothly. People couldn’t keep track of each other and a sense of community diminished. So Gore decided to cap his factories at 150 employees. Whenever they needed to expand, he just build a new factory, sometimes right next door. Things ran better this way. This famous story from the realm of corporate sociology seems to support Dunbar’s number. Malcolm Gladwell discusses it in The Tipping Point. There is more. The estimated size of a Neolithic farming village is 150; 150 is the splitting point of Hutterite settlements; 200 appears to be the upper bound on the number of academics in a discipline’s sub-specializations. One has to ask, is this all coincidence, or is it neurobiology? In her New Yorker article, Maria Konnikova points out that the Dunbar number is actually a series of numbers. The best known, 150, is the number of people we call casual friends—the people we’d invite to a large party (in reality, it’s a range: 100 at the low end and 200 for the more social of us.). From there, based on interviews and survey data, Dunbar concluded that the number grows and declines according to roughly a “rule of three.” The next step down, 50, is the number of people we call close friends; you see them regularly. Then there’s the circle of 15, the friends that you can turn to for sympathy and can confide in. The most intimate Dunbar number, 5, is your close support group. These are your best friends and often family members. But what about social media, haven’t Facebook, Instagram and Twitter greatly expanded our social networks? It seems reasonable to ask if Dunbar’s number is still relevant and if social media might have chanced upon new cognitive potentials. That is a huge question, but here is what we know so far. When researchers try to determine whether virtual networks increase our strong ties, they find that the essential Dunbar number,150, remains constant. Bruno Gonçalves & colleagues at Indiana Univ. looked at whether Twitter has changed the number of relationships users can maintain over a six-month period. They found that, despite the relative ease of Twitter connections compared to face-to-face ones, the people they studied could only manage at most 100 to 200 stable connections. When Nicole Ellison at Michigan State questioned undergraduates about their Facebook use, she found that while their median number of Facebook friends was three hundred, they only counted an average of seventy-five as actual friends. With social media we can easily keep up with the lives and interests of far more than a hundred and fifty people. But without investing the face time, we lack deeper connections to them, and the time we invest in superficial relationships comes at the expense of more profound ones. We may widen our network to two, three or four hundred people that we see as friends, not just acquaintances, but keeping up an actual friendship requires resources. “The amount of social capital you have is pretty fixed,” Dunbar says. “It involves time investment. 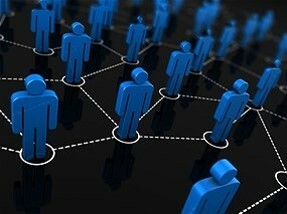 If you garner connections with more people, you end up distributing your fixed amount of social capital more thinly so the capital per person is lower.” If we’re busy putting in the effort, however minimal, to “like” and comment and interact with an ever-widening network, we have less time and capacity left for our closer groups. Robin Dunbar discusses these things in a video, and Dunbar’s number has been popularized by Malcolm Gladwell’s The Tipping Point: How Little Things Can Make a Big Difference, Duncan J. Watts’ Six Degrees: The Science of a Connected Age (review) and Small Worlds: The Dynamics of Networks between Order and Randomness (review), and Mark Buchanan’s Nexus: Small Worlds and the Groundbreaking Science of Networks.